Earlier this week, I had the honor of joining Gov. Greg Abbott at the Governor’s Mansion for a reception honoring the recipients of the Governor’s University Research Initiative awards. So far, Texas A&M has received roughly two-thirds of the awards from this fund, which was created by the Texas Legislature in 2015 to help us recruit nationally and internationally acclaimed researchers and their teams to public research universities in our state. These funds have provided a critical boost to the efforts we began in 2013 with our Chancellor’s Research Initiative, which also sought to recruit Nobel Laureates and National Academy members to Texas A&M. Four of our GURI recipients were on hand to thank Gov. Abbott and be celebrated by him. These individuals are leading experts in fields relating to national security, smart grid cyber security, nanomaterials and theoretical quantum optics. In addition to educating our students, but they will build a research infrastructure at Texas A&M that will attract even more high caliber faculty as well as private businesses to improve our state’s economy. The Austin American-Statesman featured one of our Aggie professors in their coverage of the push to keep making the smart, strategic investment in the GURI program. I hope you will take a minute to read the story. For many professors, a position at an Ivy League school is about as prestigious as it gets. For Richard Miles, jumping ship from Princeton University for Texas A&M University was an easy decision. Thanks in part to a $5 million grant from the Governor’s University Research Initiative, Miles will have a hand in developing a new laboratory with specialized equipment for studying the movement of pollutants and hazardous materials in the air. No other lab in the world will have equal capabilities, he said. Gov. 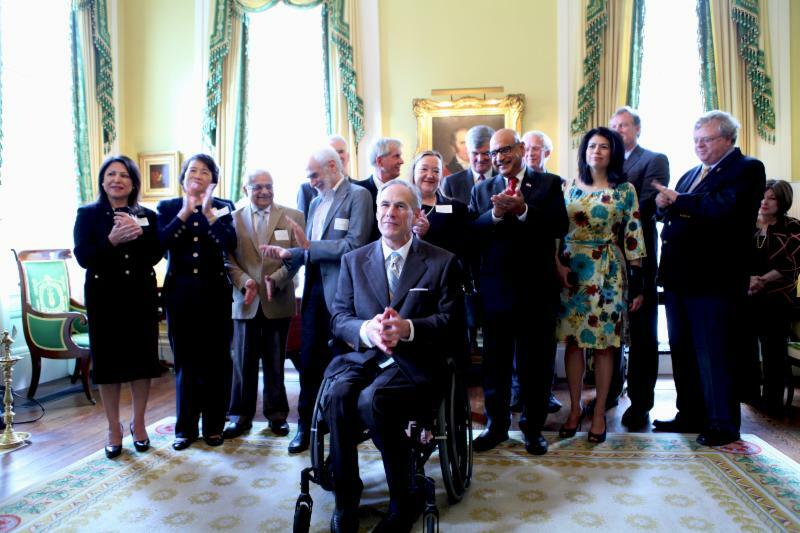 Greg Abbott hosted Miles and several other top researchers Monday at the Governor’s Mansion to celebrate their arrival in Texas and to urge lawmakers to allocate $40 million to the initiative for the next two years. The program was established with nearly $40 million two years ago as one of Abbott’s top priorities, and a total of nine researchers have been recruited to A&M, the University of Texas and the University of Houston. But neither the House nor the Senate gave the initiative any money in its proposed budget for the 2018-19 biennium. “What these individuals are doing is far more than just creating the next generation of science, technology, engineering and math. They are partnering together with private enterprises, with federal government grants, creating teams that create more jobs, that empower the next generation of the Texas economy. The people behind me are just as important to the future of Texas as Sam Houston was to the future of Texas at his time,” Abbott said in a reception room where a portrait of the Texas Revolution hero and first president of the Republic of Texas hangs on a wall. Under the research initiative, universities match the state grants dollar for dollar, meaning that A&M put up $5 million as part of Miles’ package. Grants from the governor’s fund go toward the purchase of research equipment and construction or renovation of facilities to support research. Miles, who has collaborated with counterparts at A&M for years, said his work involves the use of lasers and radar to detect pollutants and other materials in the air, and to discern the motion of the air. Such technology could be important to the oil industry for detecting methane leaks and to homeland security officials for detecting explosives and biological weapons such as anthrax.